We’re one of the only Christian universities to offer a degree in culinary arts. Food is a gift from God that connects everyone in the world—everyone eats, and everyone enjoys eating great food. In studying culinary arts at BJU, you’ll go far beyond getting an excellent culinary education to learning how you can reflect God in the beauty, creativity and mastery of food. You’ll also learn how God uses food to remind people of their dependence on Him for everything, and how God has designed the temporary satisfaction found in food to draw people to Himself, the only true Satisfier of their souls. At BJU, you’ll lay a solid foundation in the concepts of culinary arts as you prepare to be a culinary expert. You’ll learn how to create delicious foods from scratch, how to prepare food using different methods of cooking, and how to build complex flavors. In addition, you’ll gain valuable hands-on experience in a variety of settings so that you can master your culinary skills. As part of your degree, you’ll also develop the critical skill of determining food cost so that you know how much each dish you make costs and how to make a profit as an eating establishment. Additionally, you’ll take the ServSafe exam, an accredited food and beverage safety exam administered by the National Restaurant Association. Many businesses in the food industry require employees to pass the exam before beginning work, so you’ll be prepared for your field immediately upon graduation. Culinary arts is a two-year associates degree, though you may also wish to pursue a bachelor’s degree after graduation in another field. Continuing on for a bachelors degree normally takes an additional three years. The food industry, with more than 20 million workers, is in need of Christians who faithfully follow Christ. You’ll take courses in English and speech to improve your communication skills, and a course in mathematics that will further develop your skills in costing out food. Your Bible courses will help you build a solid foundation in the truth of God’s Word so that you’ll know what you believe about God and why you believe it. More than that, you’ll be inspired to live out your faith in the workplace and share the good news of Jesus Christ with those around you. Culinary arts is a very involved major, and much of your class schedule is predetermined based on your required courses. As such, you will have little opportunity to take extra courses. If you still wish to take additional Bible or liberal arts courses, you may want to explore the option of taking courses via BJUOnline over the summer. Culinary Arts is much more than a major. Culinary Arts at BJU is a family within a major! The Chef Instructors have helped me to improve and to further develop the gifts that God has given me in the kitchen. They are much more than instructors. I consider them as family because of the care and dedication they have invested in my life, which has helped me pursue a life dedicated to food but most importantly a life dedicated to Christ. I have been encouraged to grow and challenged to become a better chef as well as a better individual at BJU. 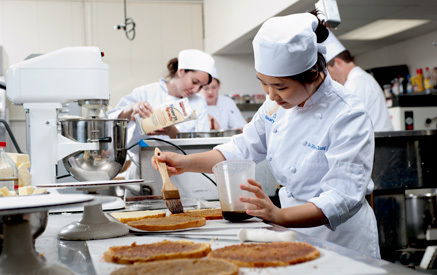 BJU’s culinary arts program is a hands-on program. It’s about cooking, building flavors, experimenting, and preparing you to be an excellent chef. Throughout your studies, you’ll work with commercial kitchen equipment and experience real-life kitchen conditions. With the limited kitchen space, you’ll learn the importance of communicating with your classmates and organizing your tools and ingredients. You’ll have many opportunities for hands-on culinary experience. During the first semester each year, you’ll be able to participate in our Friday bistro lunch. In second semester, you’ll have the opportunity to participate in our evening fine dining events where you and your classmates will be responsible to prepare and serve a 6-course meal. In these events, you’ll learn how to arrange dishes that appeal to the senses, how to price each dish to make a profit, and how to give your customers a great dining experience. At BJU you’ll have many opportunities to put your skills to the test in a professional catering setting. Culinary arts caters for a number of events both on campus and off. Each catering event is carefully chosen to give you valuable food service experience and help you grow familiar with every aspect of the industry. BJU’s culinary arts faculty are members of the nationally recognized culinary organization American Culinary Federation, and they have earned degrees and professional certifications, including the Certified Pastry Culinarian through the ACF and the ServSafe food protection manager certification through the National Restaurant Association. They have more than 45 years of combined culinary experience, and an additional 15 years of teaching experience. Utilize best cooking and baking techniques in food preparation. Apply professional standards in sanitation, food safety and equipment operations. 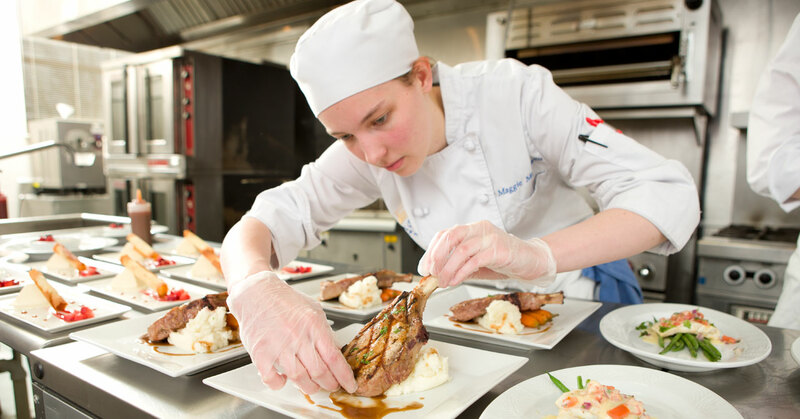 Perform meal planning and food production procedures in a la cate and prix fixe dining. 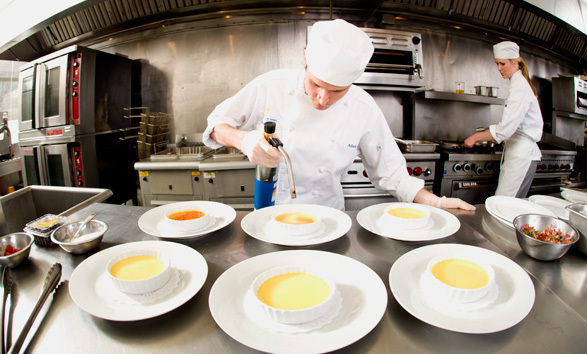 Analyze restaurant operations, personnel management and costing controls.